Long before we were blessed with children I dreamed of owning a Bed and Breakfast. 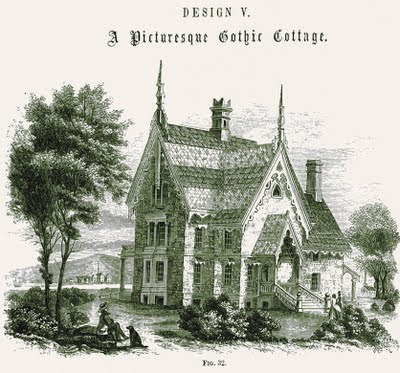 When my husband and I would travel we always reserved a night or two in a B n B. We loved everything about it! More often than not we were greeted by cheery Inn Keepers who were happy to see us. They always had something hot or cold to drink and a snack just in case we were hungry from a long day of traveling. 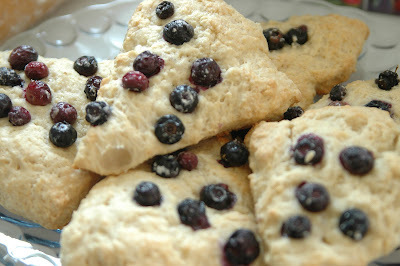 After a comfy nights sleep we would awake to wonderful aromas coming from the kitchen early in the morning. We couldn't wait to get down to the antique-filled dining room to see what tasty home made treats were in store for us! I remember one breakfast in particular. Home made Scones baked from scratch, banana and walnut pancakes, fresh fruit, apple smoked sausage, fresh squeezed orange juice and hot coffee. What delighted me even more was the way each inn keeper set their breakfast table with lovely antique linens, dishes, real silver and crystal. A simple arrangement of freshly cut flowers placed in the center of the table for an added touch of elegance. Most Inn –keepers love telling their stories so we never had to be in suspense for too long wondering about the history of the home, where all those beautiful dishes came from and how they landed such a great deal! We stayed in many different types of Inns over the years. On a trip up the Northern coast line of California we stayed in a lavishly decorated Victorian Inn in the quaint town of Ferndale, and a more modern affair in Eureka that had a jetted tub inside the room! Then there was the ranch style inn in Little River where each room was outfitted with its own four poster bed, fireplace and an amazing ocean view. 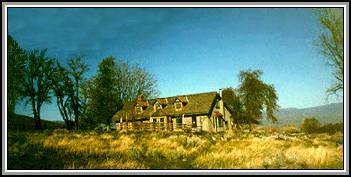 My all time favorite inn was “The Old Pioneer Garden” in Unionville, Nevada. A tried and true self sufficient homestead at the end of a dirt road in the middle of no where. When we stayed there the main guest house was only 5 years old but had been built to feel as if it were no less than 100. The food we ate was all grown right there on the ranch. Milk, eggs, meat, veggies and herbs! If you’re like me, you have to bring home a little souvenir of some sort when you travel. 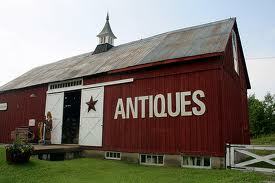 Just so happens, they had Antiques for Sale in the barn. I have a few “treasures” in my china cabinet to help me remember our stay and the friends we shared that weekend with. Naturally, people who run such a place are what really make it interesting and we thoroughly enjoyed visiting with proprietors Lou and Mitzi over a delicious lamb chop dinner. I don’t own a bed and breakfast like the ones we used to stay in, but I did get one that’s right for me! Mine is called Moms Bed and Breakfast! Open 24 hours- year round. My hubby makes a mean Sunday waffle breakfast complete with home-made syrup, sliced ham and fresh fruit. I set a pretty table and brew the coffee. The kids are the clean up crew! Nope, it’s nothing like those fancy inns of days gone by, it’s even better. Pour water in a large pot and add all sugar. Bring to a low boil then reduce heat stir and let cool for an hour or so. After it has cooled you can add the flavored extract and serve. Store your syrup in a glass container in the refrigerator. For Organic syrup, just use all organic ingredients! This post is linked to Verde Farms Farm Friend Friday! Do you dream of a Garden Shed of your own? I do but I want it to be different, and affordable. I've been thinking how wonderful it would be to create one from reclaimed materials. Imagine what a fun treasure hunt it would be to go off in search of old doors, windows, metal roofing, and all things gardening for inside. I was catching up with a few of my favorite blogs this am and there it was! I found some inspiration for all of us re-purposing fans. Pamela of Backwoods Cottage is featuring just such a garden shed today on her blog. It's right up our re- purposing alley! Go take a peak and tell her I sent you! 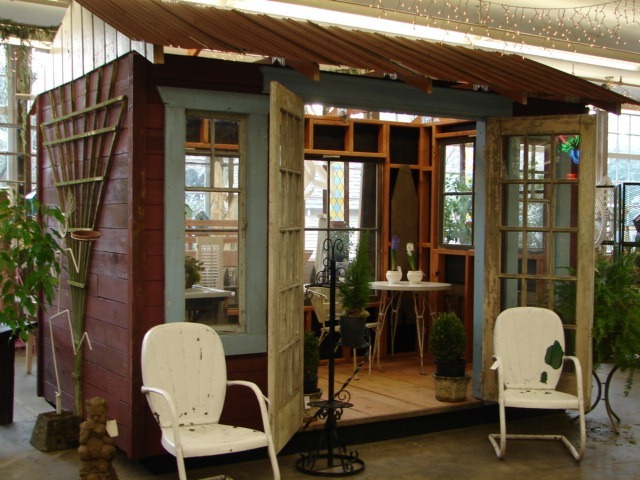 And, go meet Sharon Lovejoy's " little sprig", her garden shed build from re-claimed materials! It's darling! There seems to be a revolution going on! A Homestead Revolution! 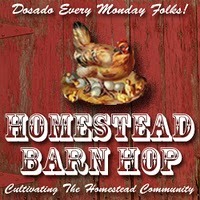 Today is the first Homestead Barn Hop hosted by Amy of the fast growing Homestead Revival Blog. Write a post about any homesteading activity you do from keeping chickens, to making your own soap or becoming a Bee Keeper like Amy! Go for it Amy! 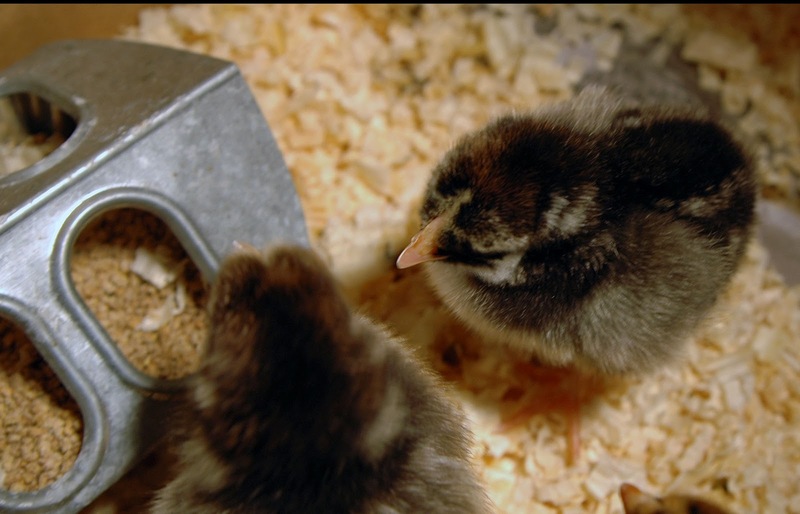 As for us and our little suburban homestead,we keep chickens, enjoy organic gardening and cooking, homeschooling and creative re-purposing! My Simple Homemade Ham and Cheese Quiche with backyard fresh eggs. We've got a couple of cute little Barn Red out buildings that satisfy my big farmgirl heart! Our girls are " old ladies" now so we'll be adding to the flock this spring. 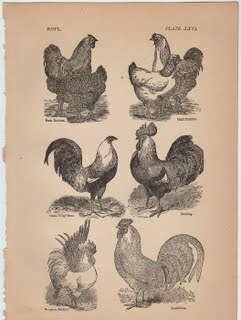 We love the Araucana, Wyandotte and the Barred or Plymouth Rock laying hens. They have proven to be very hardy through New England winters. They're friendly and good layers too. 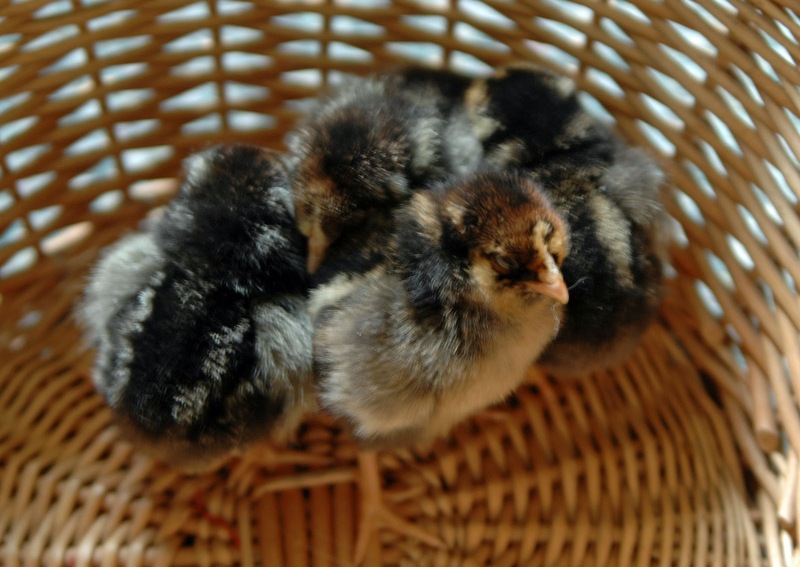 It's just about time to select new baby chicks for this spring. 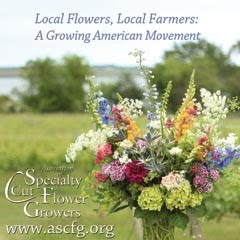 We order ours from a local landscape and farm supply. 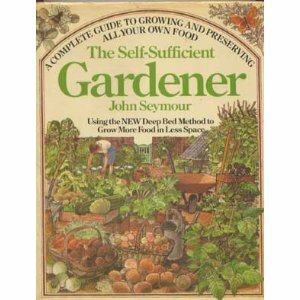 One of the first books I read on homesteading was the Self Sufficient Gardner by John Seymour. It's a wonderful guide for learning how to grow and preserve your own food. Of course with the Internet, and now blogs that information is available at the click of a button but I still find comfort having it on my book shelf and refer to it each spring and summer for new ideas and inspiration. When I discovered Mary Jane's Farm magazine a couple of years ago it added a whole new meaning to homesteading for me. Now I see it from a farmgirl perspective! It's more fun and every little thing I do different counts and is worth celebrating. Going organic and being more mindful of where our food comes from doesn't have to be so serious. It should be fun and a celebration of life! In fact, MJF farmgirl chapters are sprouting up all over to share homesteading experiences. 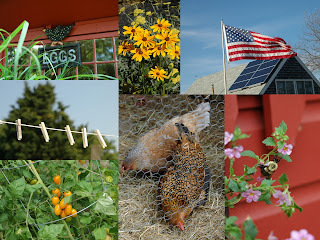 Besides the fact that homesteading is challenging, life giving and rewarding it's also American! 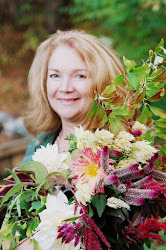 Thanks for starting the Homestead Blog Hop Amy. I'm looking forward to seeing how other homesteading families are living healthier and closer to the land. If you have a scene you wish to share include the link with your comment! Guess whose back? Our very own Dandelion Fairy! Isn't he adorable? He can be a bit naughty at times ( like when the front yard becomes over taken with dandelions) but most of the time he's a lot of fun to have around. He's been known to inspire some good things around here too. Come to think of it, it was his idea for me to start this blog! tiny green shoots of our Crocus bulbs have been spotted in the garden by the kitchen door! 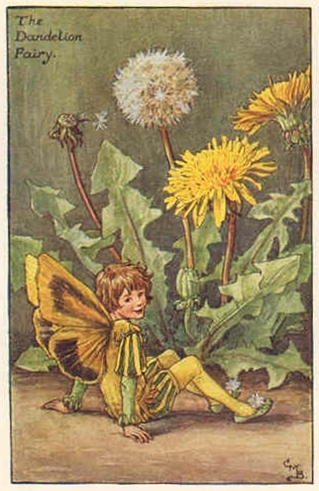 In celebration of his early return Dandelion Fairy thought it would be fun to share a refreshing sneak peak from our 2010 spring garden. I agree! I think a flower fix is in order! 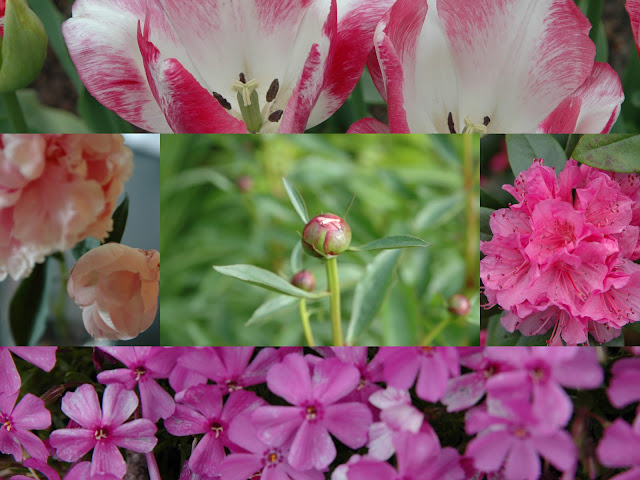 Peonies, Rhododendron,Creeping Phlox, Tulips, and Clematis. English Ivy, White Peonies, Endless Summer Hydrangea, and English Lavender . I promise that is the last time I will use the (S) word ( snow) until next winter! 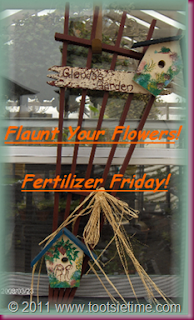 What sorts of BORN AGAIN containers do you plant flowers, herbs or veggies in? The possibilities are endless aren't they? 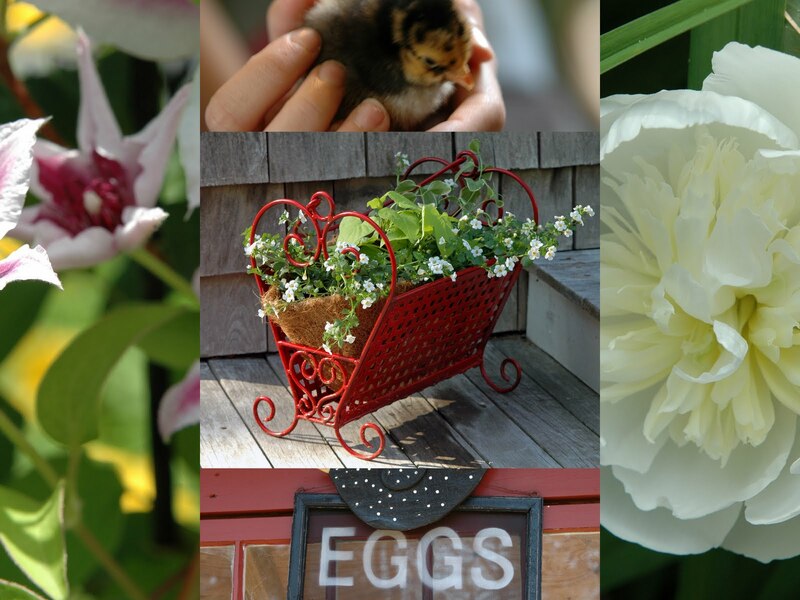 Think, galvanized buckets, aged lobster pots, coffee cans, tea pots and wire baskets. An old chair with plantings in the seat makes a wonderful, whimsical planter on a porch or as a fun garden element in a country style garden. What fun would gardening be without a little help from our Fairy friends? 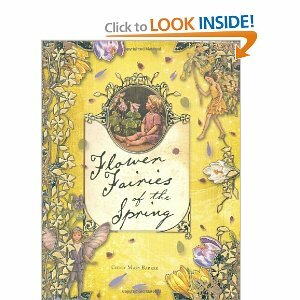 These books are reasonably priced if you are looking to purchase new copies. 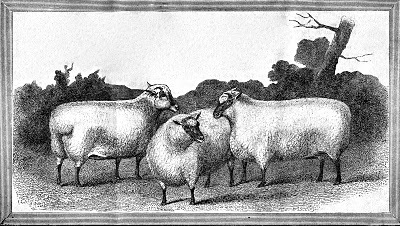 Vintage copies dating back to the 1930's will bring 100.00-155.00 per copy in good condition. You have a real treasure if you already have a vintage copy of your own. I'm linking with Tootsie Time for her weekly Fertilizer Friday! 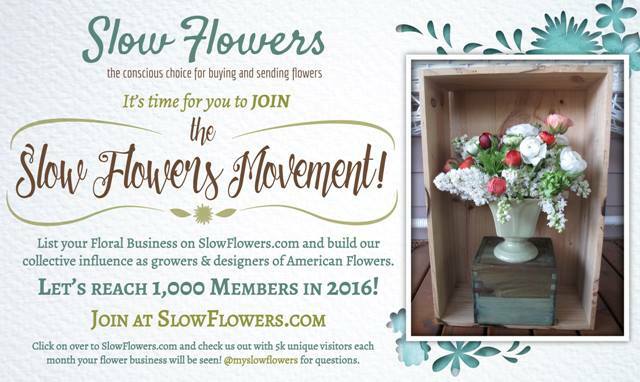 It's where we bloggers get to flaunt our flowers! FUN! We are still several weeks away from the first day of spring and I am admittedly growing weary of the snow and cold here in New England! 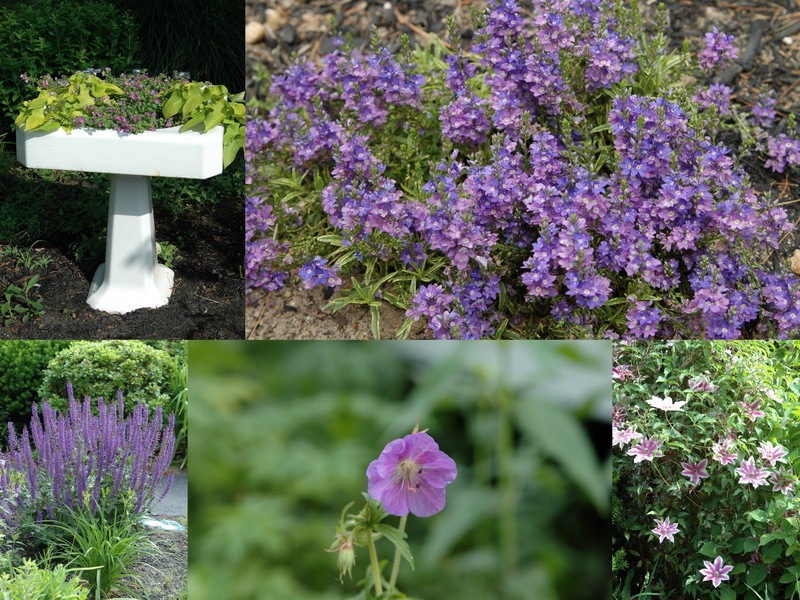 My gardening magazines and seed catalog's are luring me further into spring mode with each glorious photo of luscious flowers, plump juicy fruits and vegetables and fragrant herbs! 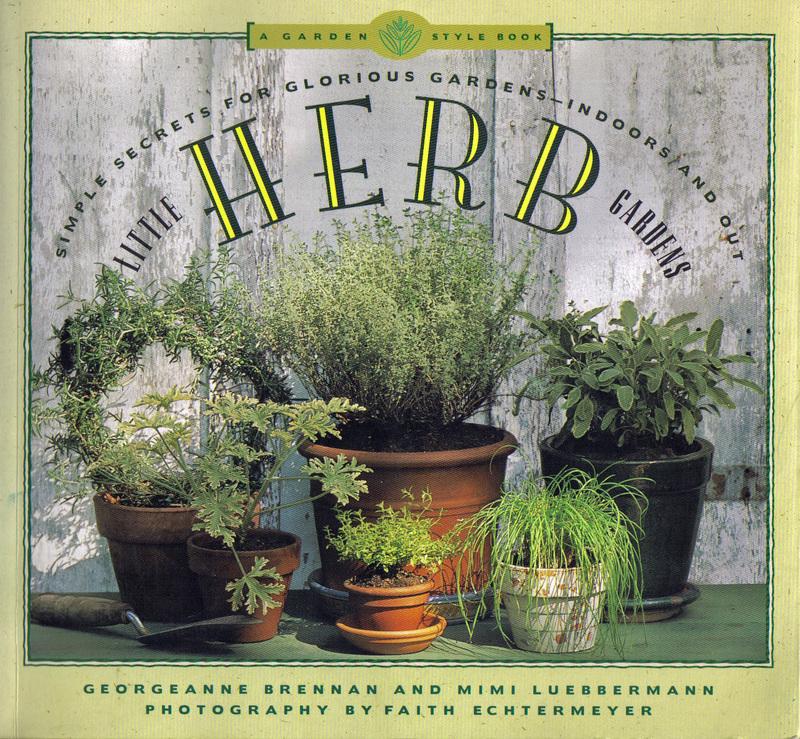 I've had the book Little Herb Gardens on my shelf for several years. Somehow my little herb garden has never sprouted. 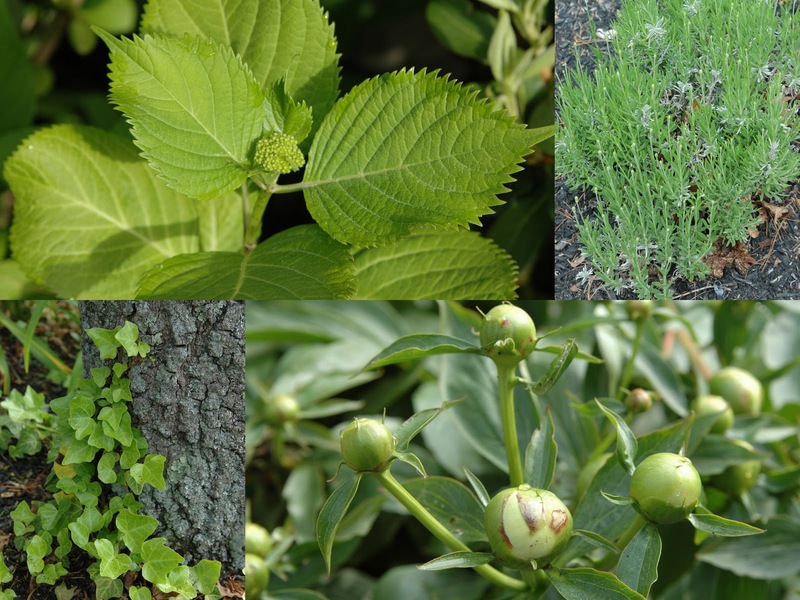 A new growing season is upon us and this year it's going to happen! 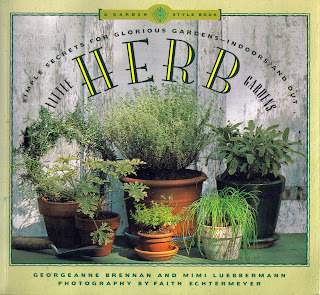 Little Herb Garden's is filled with simple instructions and inspiring photos designed for the novice herb Gardner ( me)! It's broken down into two basic sections. Outdoor potted herbs and those that will do best in a small patch of ground. 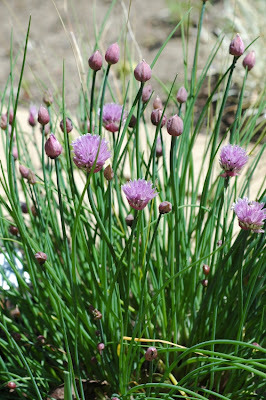 It also covers which herbs do best started from seed and seedlings. It touches briefly on medicinal uses of some herbs, exotic Basil's and features a few recipes such as Herb flavored oils and Herb Flavored Biscotti. What has finally motivated me to get going? These simple instructions for A Cut Garden. You can purchase herbs year-round at the supermarket. Simply bring them home and place them in direct sunlight for an instant herb garden while you wait for spring! Display your garden on a windowsill or kitchen counter for easy access to cutting while you cook. I chose vintage glass vases but I think pickle jars, or recycled tin cans would be cute for an urban farm fresh look. I love cilantro in guacamole, salsa, tabbouleh, and as a garnish on Pad Thai with a squeeze of lime. My favorite way to eat Chives is sprinkled on top of a big baked potato with sour cream, a dollop of butter, sea salt and pepper shredded cheese and fresh grilled bacon bits. Might as well add a nice grilled rib eye steak to that! I'll be planting some herbs by seed and will post when they begin to sprout! I'm off to bake a potato!